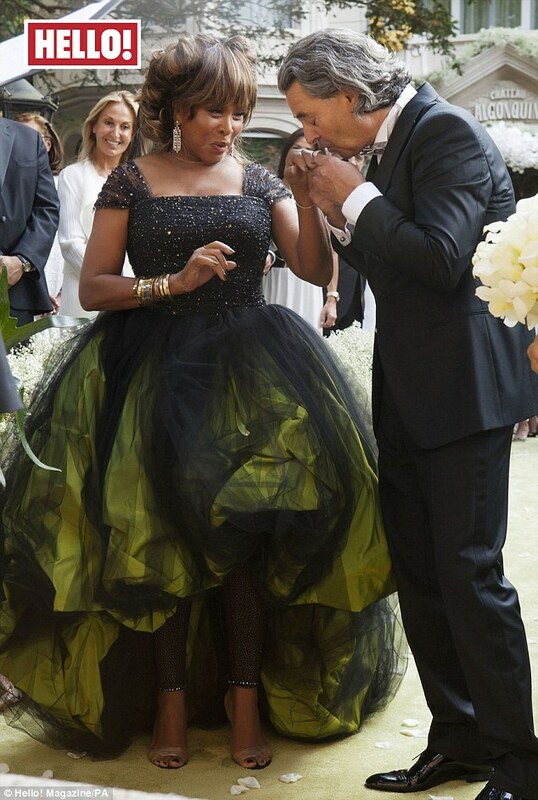 Tina Turner 73 Marries Again! :Says " Its a wonderful Place to be".. Legendary Musician and Super Rockstar Tina Turner has described being married again as a wonderful place to be. The 73 year old Rocker married long term lover of 27 years Erwin Bach who is also her music Producer in a ceremony in Switzerland recently. Speaking to Hello Magazine on her wedding feature, Tina says "'It's that happiness that people talk about, when you wish for nothing, when you can finally take a deep breath and say, 'Everything is good'. It's a wonderful place to be"
Her wedding dress which is very Different and unconventional was a green and black silk Armani gown with Swarovski crystals which she had spotted on a catwalk in Beijing and she just knew she wanted it. Tina Turner (Real Names Anna Mae Bullock) was previously married to Ike turner and Divorced in 1978. Tine sure looks great for 73 and Love so obvioulsy radiates off her.. Enjoy one of my all time bests from Tina Turner Below..